Naturally the next place I visited was Paris… (I know, it’s only the most popular destination in the world.) Ok, it’s not exactly my idea. It just happened that a colleague of mine, Aaron, was on assignment in Paris for a couple weeks. So I thought it would be great to meet up with him in Paris. Instead of taking the train, this time around, I flew from Amsterdam to Paris on an early evening flight. It cost a little more, but it’s a bit faster, and I didn’t need to watch out for connecting trains. To get from the airport to my hotel, which is in the city center area, I took the local rail and subway, and it took just under an hour to get there. The transport system is not too complicated, and it has a good website with trip planner. The hotel looks a little old from the outside, looks even older in the lobby, but the room was nicely furnished, so I was more than satisfied. Even though I had an relatively early flight, I wasn’t sure if I had the energy to go out after checking in. Feeling that there was no time to slack off, I went out after a short rest in my room. 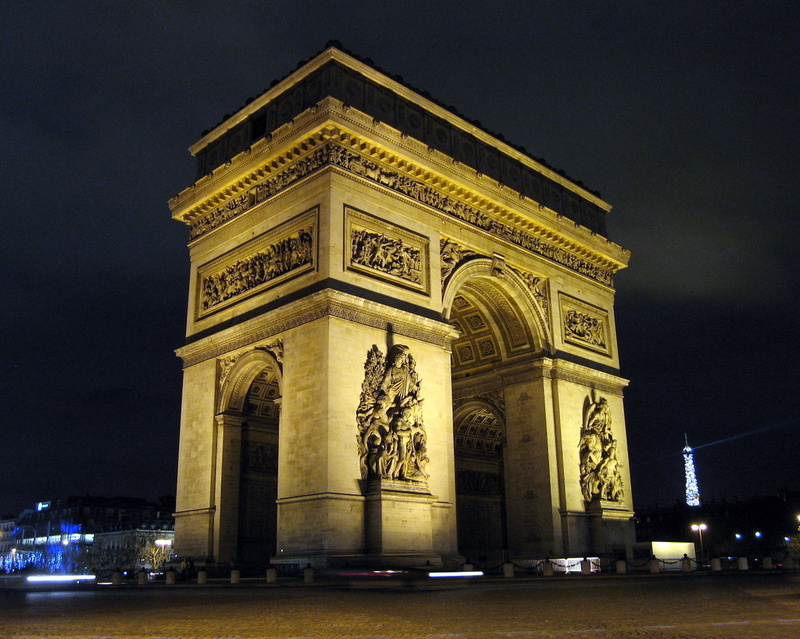 My first stop is the Arc de Triomphe. I remember when I was there last time, it made a great impression on me as I climbed up the stairs from the subway station (mainly because it’s so close to the station.) So I thought I knew what I was expecting, except this time is after dark, and my eyes were lighten up when I saw it in a nice golden glow. I must’ve spent more than half hour, walking around the monument, and taking pictures. One strange thing my friends and I did last time, was to visit the Louvre Museum without going inside. Well, technically we did go inside, but only for restroom and its bookstore. Because it was a day trip, we didn’t really have any time to spend there. I suppose we could just look at Mona Lisa and go, but that seems a little too expensive to do that. So I was quite determined to visit Louvre this time around. They say you could spend days in this museum (which also lead me to think it is dumb to pay full admission to see only the Mona Lisa.) Good thing that I was using a very good guidebook, called Rick Steves’ Paris; it highlights the artwork not to be missed there. It also provides very good commentary on each piece of artwork, makes it a bit more interesting for people like me who knows so little about art. Just as the book describes, it might be a little disappointing to see Mona Lisa for the first time; it is smaller than what most people expect, and it is a bit dark. The room where Mona Lisa situated was specifically built for the painting; something about the lighting, I think. It is the room where I spent the most for this visit, not for Mona Lisa, but because I was meeting Aaron there, who just got off the plane that morning. A few of my friends thought it sounds romantic, if only I was meeting a girl. But really, it is the most obvious “landmark” within the museum; they have many signs there, with a picture of the painting, pointing the direction to the room. But by the time Aaron got there, security people started clearing people out of that room, maybe Mona Lisa needed a breather. While I spent more than enough time looking at Mona Lisa, Aaron didn’t get the chance to see it, at least not when he just got there. We figured they would re-open the room a bit later, so we went for lunch in the mean time. I don’t usually do a lot of research when it comes to eating; I always think it could get expensive in places where tourists are, and even worse, it takes up time. But Aaron, quite a foodie himself, came fully prepared, having a list of places he wanted to try in his two weeks there. The bistro we ended up going have some tables set up outside. I’m not sure if you can call that patio because it is really taking up the sidewalk of the street. The weather was nice, not too cold or windy, so we chose to sit outside, doing some people-watching in the street of Paris, while having some good southwestern French country fare. After a nice relaxing lunch break, we went back to Louvre to see some more Mona Lisa and other art works. I am quite impressed by some of those huge paintings, and I like to take pictures of those paintings with people looking at them, to show just how big those paintings are. 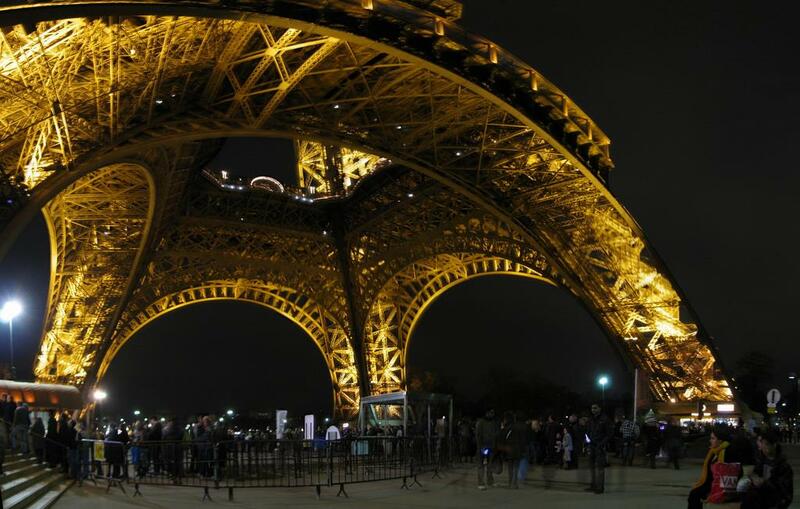 The previous time I was in Paris, I got to the base of the Eiffel Tower, but I didn’t get to go up because I had to catch a train back to London; it was such a unfulfilling experience. So this time I made sure I have plenty of time to visit the tower, it did require quite a bit of time, as the line to go up was long. We stopped at all three levels of the tower, spent lots of time on each level, snapping tons of pictures. I agree with the guidebook that the second level provides a nicer view of the city than the other two levels. We went to Sainte-Chapelle first thing in the morning, which is probably not the best time to visit. They say the best time to go is when the sun is bright, with sunlight shining through the stained glasses, lighting up the chapel like a jewel box. But we were there early, and it seemed to be another cloudy day, so there were barely enough light inside the chapel. I guess I would come here again if I have the chance. I have been to the Notre-Dame in my previous visit, but like Eiffel Tower, I didn’t get to go up on the tower. Normally there would be a long line to go up, but since we were there early in the morning, it didn’t take us long to go up. From the top, it has a great view of the Seine river and the city. Surprisingly we spent more than two hours in the Notre-Dame area, cutting into our lunch time. We were planning to go to another eatery on Aaron’s list, but because I need to leave Paris and head to the airport in the afternoon, we chose to skip lunch and visit one more major attraction, the Orsay Museum. Just like the time at Louvre museum, I followed the tour in the guidebook to see all the major paintings and sculptures. The art works here are definitely modern, as Louvre museum has a more classical collection. Having to catch a 6:30pm flight back to Amsterdam, I thought I should have just enough time to get to the airport if I leave Paris before 4pm. Taking the subway again, I got there shortly after 5pm, but there was a problem; the airport got locked down. I never find out what exactly happened, but there were soldiers with heavy weapons guarding the entrances. I didn’t worry too much, thinking that even if I missed my flight, the airline should provide some kind of arrangement. After about an hour, they finally re-opened the airport. With everyone and everything rushing inside, I somehow managed to get myself check in at a kiosk fairly quickly. I even somehow got on a priority security check line where I should not have access to (I think the workers there just want to get through this rush of people as fast as possible.) So I ended up being at the gate just when they started boarding. So I had a rather favorable experience at the Paris airport. 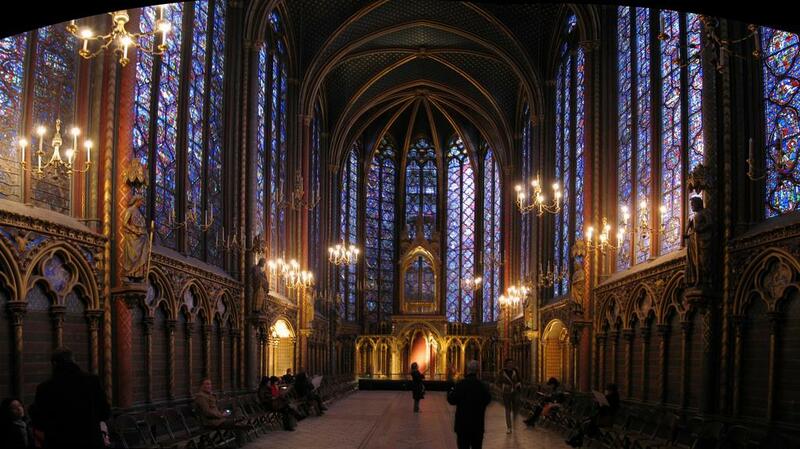 I had the same experience with Sainte Chapelle, the only difference was that I knew about it from a friend, but did not remember the place where it was located and couldn’t find it in time before leaving Paris. So the next time I went to Paris I stayed about an hour inside it and did not want to leave… It is fascinating. Visiting the tower of Notre Dame was free? I didn’t know it is open for visits. Thank you so much for your comment. As you can tell, I haven’t been maintaining my blog for quite some time; something I should start doing again. To your question, no, the tower of Notre Dame wasn’t free, but it is definitely open to visitors, although I think the opening hours might be a bit limited.